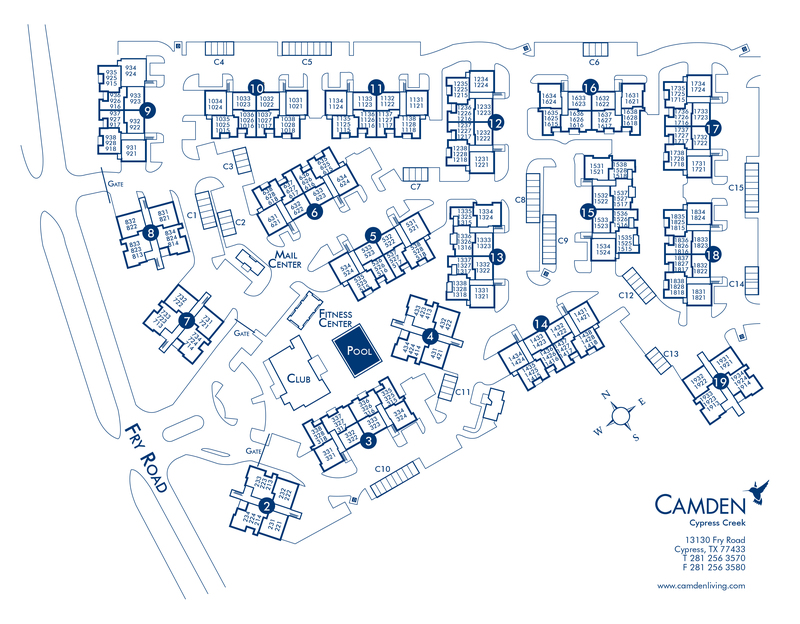 Listed among the highest-rated apartments in Cypress, TX, Camden Cypress Creek features one, two and three bedroom luxury apartment homes with direct access to Hwy 290. Perfectly located off Fry Road, Camden Cypress Creek places you in the middle of everything Cypress has to offer. Enjoy shopping at the Houston Premium Outlets or book a Tee time at the Blackhorse Golf Club right down the street. We’re also located next to some of the best dining options in Cypress – Alicia’s Mexican Grille, The Shack Burger Resort, and Cork Café. At Camden Cypress Creek, we treat you like family and we know you’ll feel right at home in our beautiful community. Take a swim in the resort-style saltwater pool, or grill some hamburgers in the outdoor kitchen. Stay fit in our 24-hour fitness center, or entertain your friends in the game room complete with billiards, shuffleboard and plenty of TVs. Our business center with adjoining conference room offers the perfect place to study or meet a few colleagues, and be sure to enjoy the nearby coffee bar as well. Rest assured your children will love it here too! We are zoned to Warner Elementary, Smith Intermediate and Cy-Ranch High School, and happy to offer the convenience of bus pick-up at the front of the community. Each pet-friendly apartment feels like a custom home with spacious floor plans, open-concept kitchens, granite countertops, tall custom cabinets, garden tubs and walk-in closets. Select apartments include large wraparound balconies, kitchen islands, wine racks and wine refrigerators and walk-in showers. Other conveniences include at-your-door trash and recycling pick-up, as well as 24-hour emergency maintenance with the best team in the city. Attached garages and carports are also available. Residents receive a technology package included in the total monthly rent with a savings of up to 53% off retail. This money-saving package includes high-speed internet up to 150 Mbps and over 140 digital video channels through Xfinity. Use the Xfinity Go app on your smartphone or tablet to access your digital video anywhere! No matter where you’re from, come home to Camden Cypress Creek. You deserve it! Call and schedule your tour today! We’re available 24/7 – (866) 613-7139. At Camden, your pets are family too! We welcome cats and dogs, up to three pets per apartment home, with a full-grown maximum weight limit of 90 pounds each. Call us with any pet-related questions! We'll save a spot for you! We offer one parking space per lease holder with ample open parking on a first-come, first-served basis. All apartment homes that end with a G include an attached garage. Detached garages are available to rent for $89 per month and carports are available for $28 per month. Visitor parking can be found around the perimeter fence and are marked.